​Approximately 6.5 million cats and dogs enter animal shelters each year, according to the American Society for the Prevention of Cruelty to Animals (ASPCA). This massive number underscores the need for volunteers to provide the necessary care to ensure as many pets as possible can be placed in permanent, loving homes. In fact, most shelters would not be able to stay open without the generosity of volunteers. From walking, feeding and bathing pets, to helping maintain shelter facilities and staffing fundraising events, volunteers are the true backbone of shelters who work tirelessly to promote the welfare of the animals in their care. Shelter volunteers deserve recognition for the vital contributions they make to transform the lives of shelter pets and the people who adopt them. For this reason, Hill’s Pet Nutrition’s Food, Shelter & Love program launched its second-annual Hill’s Shelter Heroes Contest. While each of the five winners have a unique story, they share a common bond through their passion for helping animals in need. 1. Tammie Lohnes, Kansas Humane Society: Tammie’s love for animals has kept her at Kansas Humane Society for more than 15 years. She has worked across numerous positions and is now serving as a mentor to all new volunteers and staff members. 3. 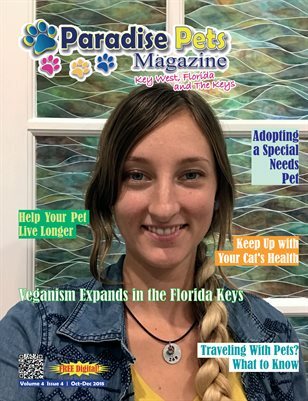 Barbara Comarda, Louisiana SPCA: Following Hurricane Katrina, Barbara drove cross-country multiple times to find good homes for pets that were affected. She has volunteered more than 10,000 hours during her 11 years at the Louisiana SPCA. 4. Mark Imhof, Animal Care Centers of NYC: Mark volunteers at two locations, multiple times a week, and is dedicated to increasing pets’ adoption chances. 5. Janie Stowell, Spokane Humane Society: Janie has helped the most vulnerable pets find happiness, and has donated more than 8,500 hours (and counting) to help animals in need. To learn more about Hill’s Pet Nutrition’s Food, Shelter & Love program, visit www.hillspet.com/shelter. The program has provided more than $280 million worth of food to more than 1,000 shelters since 2002. ​To learn more about volunteering at a local shelter to make a difference for animals in need, visit www.humanesociety.org/community/volunteers. It’s a warm summer day — the sun is shining, the sky is blue and the scent of blooming flowers fills the air. As a pet owner, you’re probably planning to take your dog on a walk, maybe even several. Meanwhile, your cat has found that sunny space underneath the windowsill. If so, then you already know how much cats and dogs enjoy basking in the sun, but just like people, over-exposure to heat can cause our furry friends to become varied versions of themselves. And too often signs of dehydration, which frequently appear in the form of lethargy, dry mouth and loss of appetite, are confused with run-of-the-mill exhaustion. Considering all the things we do know about our pets, it’s hard to believe that we wouldn’t recognize the symptoms that accompany something as serious as dehydration. But the truth is that unless you know which indicators to look for, it can be easy to misdiagnose. That’s why the experts at PetSafe have compiled a list of tips and tricks for making sure your pet is experiencing healthy hydration all year long. Water is without a doubt the single most important resource you can provide your animal, especially during hot summer months. Whether outside or inside, dogs and cats should consume around one ounce of water per pound each day. In other words, if you have a 20-pound terrier or a 20-pound tomcat, they should have access to at least 20 ounces of cool, clean drinking water every day. It’s also important to remember that liquid can evaporate quickly in high temperatures, so if your pet’s water source is outside it’s best to check on the amount of available water several times throughout the day or consider purchasing an auto-fill watering bowl like the Drinkwell(R) Everflow Indoor/Outdoor Fountain by PetSafe. ​How do I detect dehydration in my pet? Lack of skin elasticity. You can test this by gently pinching or pulling some of their skin. If it doesn’t return to a normal position, your pet is likely dehydrated. If your dog or cat exhibits any of these behaviors or symptoms, it’s important to seek veterinary attention where they will likely monitor the body temperature of your pet. To prevent dehydration, pet parents should consider taking active measures to encourage pets to drink more water. Products like PetSafe Brand Pet Fountains are designed to continually circulate and filter water. This not only provides dogs and cats with a steady source of fresh water, but relieves owners of the constant hassle of refilling the bowl. Plus, the sound of flowing water tends to trigger an animal’s desire to drink more. With proper care and precaution, your pet can enjoy every season — even summer — while staying happy, healthy and hydrated. Visit PetSafe.com to find more great tips, products and articles on pet care. 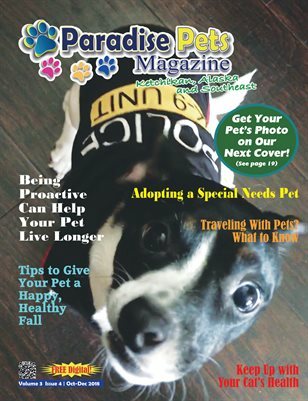 Read the summer issues of Paradise Pets Magazine before summer is over--the digital is free! On right: Key West, Florida issue--click image to read now. Below: Ketchikan, Alaska issue--click image to read now. The “clean eating” lifestyle has grown in popularity, and now it’s making its way to pet food. Terry Walters, best-selling author and dog owner, believes that clean eating – for both humans and pets – is about being mindful of what you eat and what you choose not to eat, as well as being more aware of the origin of the food in your diet. Become more conscious of what you put into your body and how it affects your overall well-being. Keeping a food journal where you record what you eat, when you eat it and how it makes you feel is one way to recognize which foods are serving you and which are not. Empower your family to make healthy choices by educating them about different foods and the nutrition they provide, and including them in everything from growing to cooking clean food. The more you know about your food, the healthier choices you can make and the more able you will be to achieve sustainable, good health. Our four-legged family members deserve the best, too. Make eating clean a priority for the whole family, including pets. NUTRO. FEED CLEAN™ dry dog food recipes, made with non-GMO† ingredients, align perfectly with clean eating values and give dogs a nutritious diet that’s tuned exactly to their needs. The NUTRO. FEED CLEAN™ philosophy promises pet owners a dry dog food with recipes that are simple, purposeful, trustworthy and made with real, recognizable, non-GMO† ingredients as close to their native form as possible. For more information and tips, visit Nutro.com. *For the purposes of this survey, “Clean” was defined as incorporating whole fruits and vegetables, recognizable ingredients, products with short/simple ingredient list into your diet and avoiding artificial flavors, colors or preservatives.